Tony Stark has it all. Money, women, fast cars, and popularity. He’s on the front cover of every magazine and the lead story of every news program. Crowds of people swarm together just to get a chance to see him. On top of all that, his new invention has everyone excited. So excited that it looks like he may have brought about world peace. Tony Stark is Iron Man, the armored avenger. So what could possibly go wrong? Iron Man 2 opens with Tony (Robert Downey Jr.) riding a massive peak of attention. He’s revealed himself to the world as the man behind Iron Man. On the surface, everything is fine. But behind the scenes, not all is well. The government are insistent that he hand over the Iron Man technology to the military. The arc reactor in his chest that saved his life in the first movie is now slowly poisoning him to death. And a figure from Tony’s past is seeking vengeance for what has been denied to him. Cue tension and character development that will be resolved with explosions. Ahh, explosions. Is there anything you can’t do? The original Iron Man movie was a surprise hit. There was a great balance between action and character development. And it didn’t hurt at all that the film was incredibly well cast with some amazing chemistry between the leads. Iron Man 2, however, doesn’t quite pull this off. Yes, there are some great action scenes. These scenes are a definite step up from the first movie. But in trying to do too much in this sequel, character development suffers. The addition of more characters and more plot means that character development suffers. Those moments we have in the first movie with Tony alone in his lab working on his armor, scenes which gave us a great understanding of who he is and why we should care, these scenes are not as prevalent. 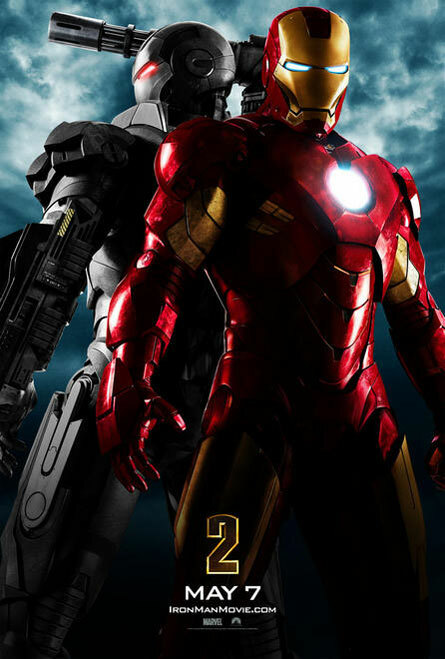 Iron Man 2 is not just a sequel. It’s a tent pole for a whole library of movies. IM2 is laying the ground work for future Marvel movies such as Thor, Captain America, and The Avengers. Nick Fury (Samuel L. Jackson) seems very out of place here. He’s not really introduced to the audience and only seems to be involved to link this movie with what is to come. The Agent Colson character could have just as easily performed these tasks and would have made more sense. The costumes worn by Fury and by The Black Widow (Scarlet Johansson) don’t really fit into the world of Iron Man. Wearing a suit of armor makes sense. Wearing a superhero costume looks out of place. As much as I love these characters, I could have done with out some of these elements in IM2. The other character issue I had was with the recasting of Rhodey. In the first movie he was played by Terrence Howard. There was a great chemistry between him and Downey Jr. You could believe that they were best friends, that there was a connection between them. In the second movie, the role is played by Don Cheadle. And the chemistry is just not there. I’m not sure if it’s because of the plot or because the two actors didn’t bounce off each other the same way, but the change in actors was noticeable and took the movie down a notch. Technology is central to Iron Man 2. Without technology you couldn’t have Iron Man. He’s the pinnacle of our human inventiveness. In IM2 it is technology that can solve all our problems. Technology brings world peace. Howard Stark, Tony’s father, opens a massive technology event with these words “Everything is achievable through technology.” You have a problem? Technology can fix it. Salvation from our problems comes through our commitment to our brains and to our hard work. And you know what? I think we believe this. We believe that if we just work hard enough, we can build the perfect world. But technology can fail. Technology is not our saviour. Because our biggest problem is that we live in a broken relationship with our creator. Fixing the problem between us and God is not achievable through technology. While technology can be a great thing, it’s dangerous to put our trust in it. Jesus said “I am the way and the truth and the life. No one comes to the Father except through me.” (John 14:6) Jesus is the real solution to our biggest problem. Are you looking for a movie with some brilliant action sequences and a sense of humour? Iron Man 2, despite it’s faults, delivers these things. While I wish it had been a better movie, it’s still a fun ride.